Home News President Benigno Aquino III President of China President of the Philippines President Xi Jinping World News President Benigno Aquino III Challenged China President "Put yourself in our shoes"
President Benigno Aquino III Challenged China President "Put yourself in our shoes"
President Benigno ‘PNoy’ Aquino III challenged President Xi Jinping of China to put himself the Philippines’ situation in an interview with South China Morning Post that was released on April 20, 2015. He had shared the effects of China’s construction activities in West Philippine Sea, a disputed area. 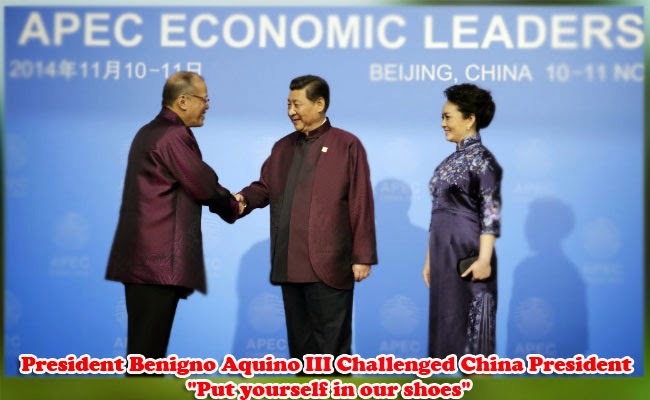 Aquino shared that he would like to know what will president Xi will do if their places were changed. What will he do with the Philippine’s struggle in the South China Sea. The Philippine president said that the maritime and territorial dispute currently happening in the West Philippine Sea, known to China as South China Sea, is an issue that can be removed. Philippines is protesting against China’s reclamation activities which deals with building of artificial islands in disputed waters of West Philippine Sea. It was on April 14 when Armed Forces of the Philippine reported the development of activities of China in the West Philippine Sea. If the activities were to see through, the country’s access to the disputed sea. The building of the artificial islands had already destroyed around 300 acres of corals that can lead to annual losses of $100 million. The reclamation activities of China not only affects the Philippines but also alarmed the other world leaders including the G7 or Group of 7 which is comprised of the seven most industrialized countries. The foreign ministers of G7 had criticized the building of artificial islands by China. US President Barack Obama said that China must not elbow aside the countries it has conflict with. Due to the threat from China’s aggressive activities, Philippines is set to have a strategic partnership with Vietnam which also claims part of the disputer sea. Aquino shared that the details are yet to be finalized. The strategic partnership aims to have stronger alliance against the security threat from China.